Instructor Charles Arroyave teaches a lesson to (from left) Taj Weems, Jalen Hanton and Jalen Buffert. 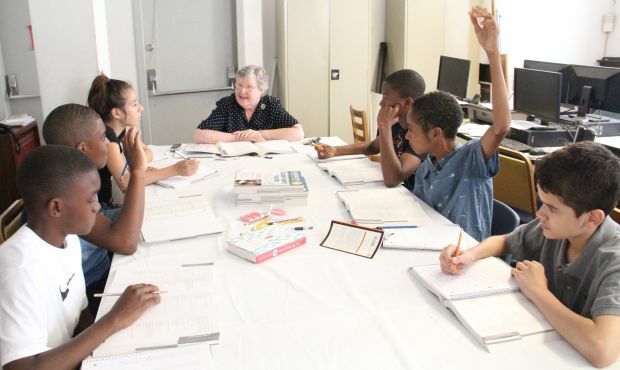 Inn Dwelling, one of the community groups to receive a local grant through the 2013 Catholic Campaign for Human Development, is an example of a community-based group that has evolved to meet additional needs in its Germantown neighborhood. Based in St. Vincent Parish, it was founded in 1981 by Vincentian Brother Al Smith with an original mission of acquiring and rehabilitating decaying houses and making them available to families in need. The program doesn’t just give a house to anyone. It looks for working families who have never experienced home ownership and provides the house at below market rent. The tenants must attend mandatory meetings on issues involving ownership, and after three to five years, if they are ready, they are afforded the opportunity to buy the house or are encouraged to buy a house elsewhere. Over the years, Inn Dwelling has rehabbed about 40 houses, Brother Al estimates, and a number of them have been bought by former tenants. “We have about 18 houses now, and we are working to rehabilitate three,” Brother Al said. Although Inn Dwelling does employ a full-time handyman, a good bit of the work is done by volunteers, even a licensed roofer, plumber and electrician. 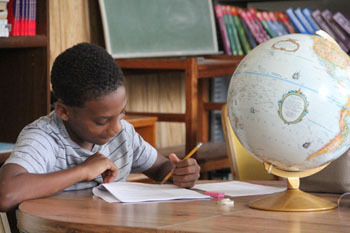 Young scholars find a comfortable place to study at Inn Dwelling in Germantown. While housing remains one facet of the work of Inn Dwelling, in more recent years education has come to the forefront. That largely came about when Missionary Servant of the Most Blessed Trinity Rosemarie Jefferson arrived in 1994 first as part time but very soon full time and education became a very large part of Inn Dwelling’s ministry, which makes perfect sense. Nothing eliminates poverty quicker than sound education. “We teach religion at Holy Cross School,” Sister Rosemarie said. 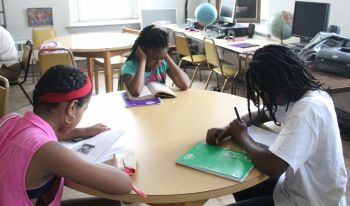 In the after-school program there are 30 kids in grades six to eight and 60 in grades nine to 12. Carl Whittington, left, works with fellow student Christopher Peralta at Inn Dwelling. Part of it all is exposing the young people to new experiences, helping them to realize their potential. 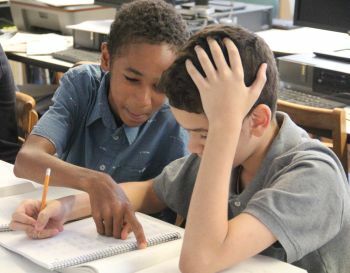 A great stress is made on preparing the teens for the SATs and it works, judging from the schools that have accepted them — Haverford, Villanova, De Paul, St. John’s, St. Joseph’s and Gwynedd-Mercy, just to name a few. Although most of the children are not Catholic, faith in God is instilled in them. “It must seep into your culture and transform it,” Sister Rosemarie said. Through this example there have been a number of conversions to Catholicism, she noted. Charles Arroyave was one of the first teens to go on to graduate from college. Through Inn Dwelling he obtained a full scholarship to West Catholic High School, then went to Chestnut Hill College. Jeffrey Wilson takes a test in the Inn Dwelling library. 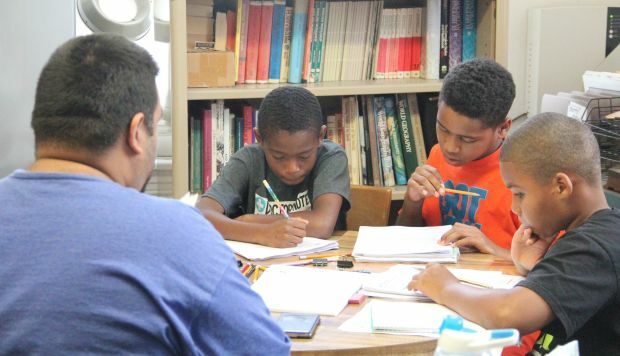 Now he is a math teacher in an urban school and a teacher in the Inn Dwelling program while pursing his master’s degree in educational leadership.